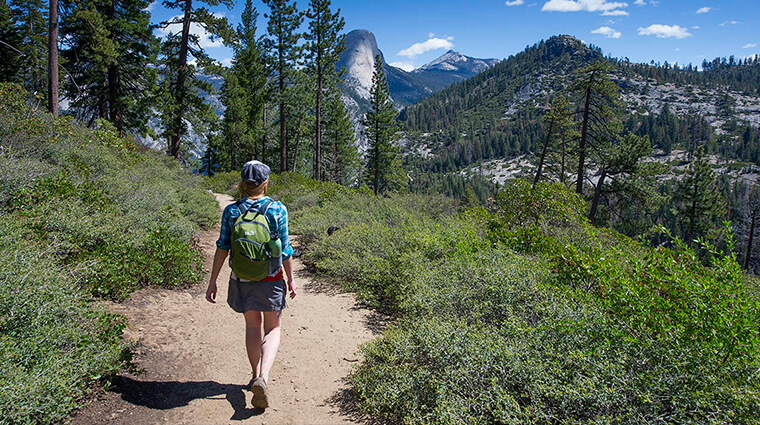 Begin at: Panorama Trailhead, Glacier Point (trails ends at Happy Isles in Yosemite Valley). 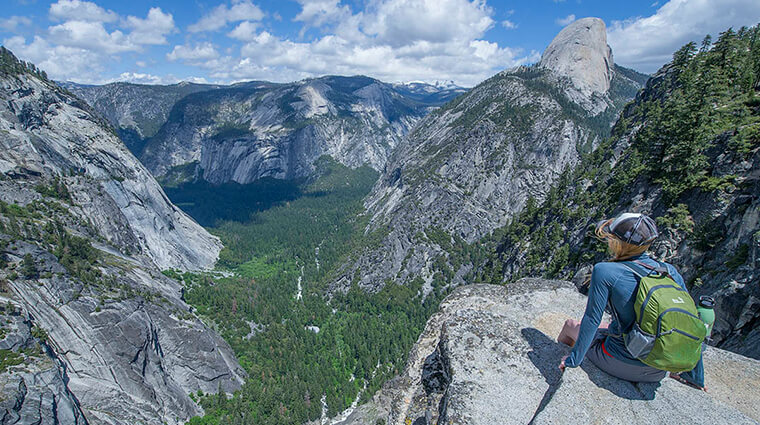 You’ve heard of the Half Dome Hike, Yosemite Falls Hike and the Mist Trail, but you’ve probably never heard of the Panorama Trail, arguably Yosemite’s most scenic trail. For those who are motivated for a full-day of hiking there’s arguably not a better trail to showcase the park’s natural treasures. There are several ways to enjoy this trail. 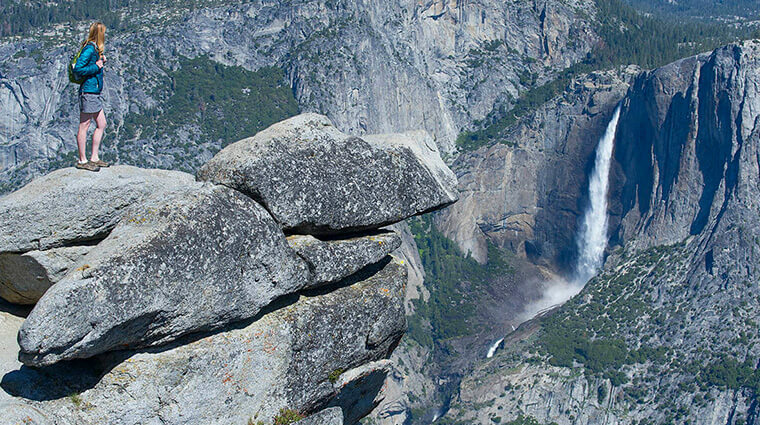 For a moderate hike, start at Glacier Point and hike down to the Valley Floor. You can take the Glacier Point Tour (recommended) bus one way or you can plan to leave a car at the top of Glacier Point to pick up later. 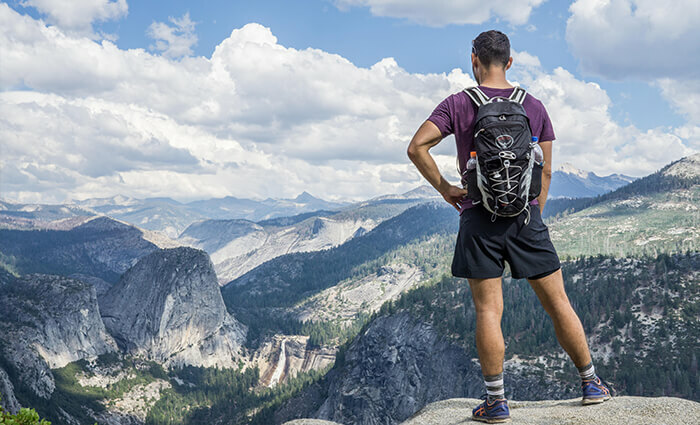 Starting at Glacier Point offers sweeping views of the iconic Half Dome and the high peaks of the Clark Range. A real highlight is peering down into Yosemite Valley, 2,700 feet below. The first section of hiking dives down into Ilillouette Creek, with cascading falls and prolific birdlife. Leaving the creek, there is a short, steep climb up a sandy ridgeline. From there, the trail traverses the top of Panorama Cliffs among the yellow pines and cedar trees (don’t worry, it’s on a nicely groomed trail!). 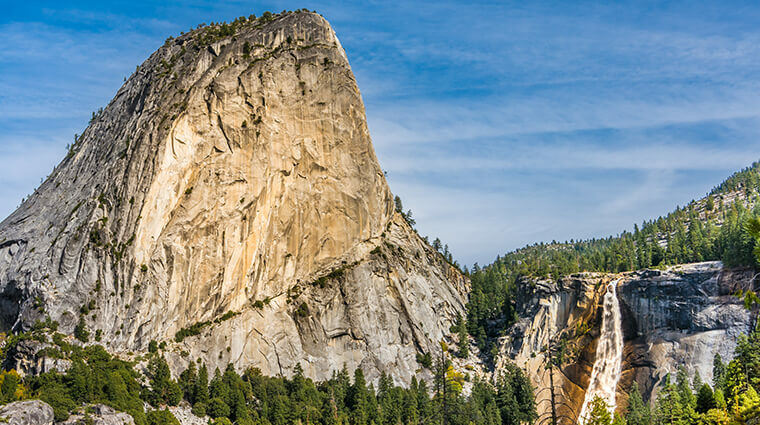 Along the way, you’ll see more views of Half Dome, and across the valley to Yosemite Falls, North America’s tallest waterfall at 2,425 feet. After a few miles the trail descends once again, bringing you to the top of Nevada Fall. Plan to take some time here to take in the views down-canyon. 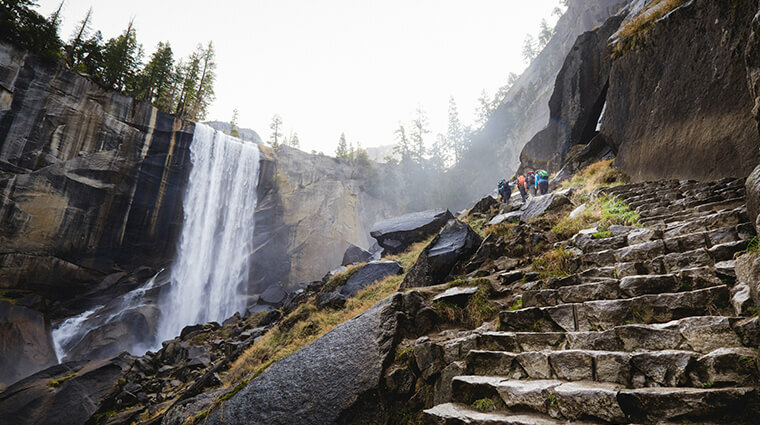 The final section of the day follows the popular Mist Trail, descending the Merced River, passing the rushing Nevada Fall and then Vernal Fall in the lower canyon. The trail ends in Yosemite Valley, just a quick shuttle ride to the pizza deck and store at Half Dome Village. Although the Panorama Trail is just 8.5 miles in length, it often takes people 4-6 hours to complete the trail one way. Not only are there many exceptional vistas and rushing waterfalls to spend time at, but also there are many granite steps along the Mist Trail, which often slow down the pace at the end of the day. Give yourself plenty of time to enjoy the trail and not be rushed. On the first section of the trail, in the springtime and early summer, keep your eye out for male Blue Grouse playfully dancing for the lady grouse. These large birds have colorful air-sacks that they inflate and they must execute the dance in good form, or they risk the female losing interest. If you are hiking this trail in the springtime or early summer, bring a light rain-jacket for the Mist Trail section if you are planning on exiting later in the day. Cool afternoon winds blow through the shady canyon and not everyone appreciates being soaking wet after passing Vernal Fall. 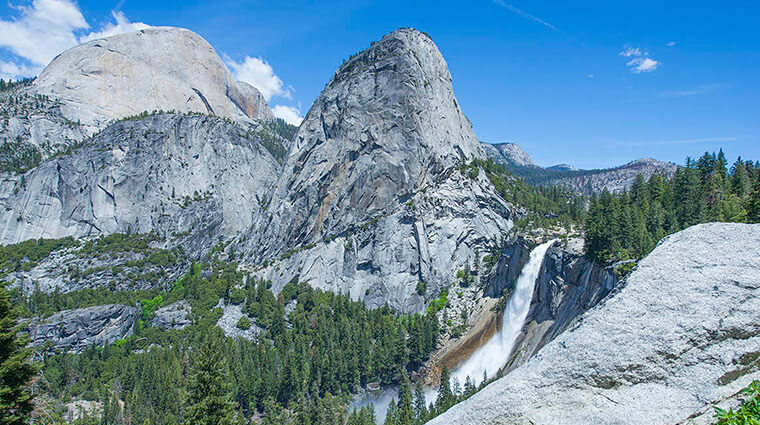 While this is an excellent day hike, you should be aware that some planning is required to best enjoy this trail as it is a one-way trek down to the Valley Floor from Glacier Point. Plan to leave your vehicle at Glacier Point and have a second vehicle return you to the point at the end of the trek, or the better option is to take the Glacier Point Tour one-way to the top of Glacier Point and hike back down to Happy Isles, utilize the free shuttle bus to return to your vehicle. If you are interested in a strenuous (but totally amazing hike!) you may also wish to add the Four Mile Trail to the Panorama Hike, which is 14 miles. This way you start at the Mist Trail and continue to the top of Glacier Point by foot, descend Glacier Point down to the Valley Floor.